About ten years ago, I went to a small independent movie theater on the North side of Chicago. I saw a film that was made on a tiny budget with two actors and some extras. Gerry is about two nameless guys played by Matt Damon and Casey Affleck. They park their cars along a road to see a historic monument thinking they'll only be gone an hour or so. Being in the moment and having an overanxious way about them, they don't bother to bring any food and water. They also follow a worn out trail which causes them to be lost in a vast desert wasteland with no shelter in sight. Reflecting on Gerry 10 years later, it reminded of a few films that came before and after its release. Part Blair Witch Project (1999) and part Open Water (2005), it's an exercise that effectively relies on minimal movie resources to create real tension and fear. There are critics that have deemed it slow and polarizing. I found it effective because the stars are real life friends who's chemistry is evident throughout the film's entire length. As they try to find water and civilization, time is running out. You get so involved with their plight that you're right there with them every step of the way. The movie's only low point could possibly be the ending. It drags on and toys with the audience. It could have used a little editing. However, the ride to get there is worth it. The film was directed by Gus Van Sant. With vehicles like Good Will Hunting (1997) and Drugstore Cowboy (1989), in 2002 this was a complete different turn from what he had done before. I'd call him "Guts" Van Sant for making something this risky. He's pulls it off. 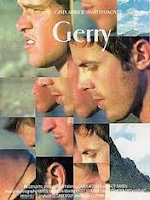 With a hauntingly beautiful music score and breathtaking cinematography, Gerry is a small gem of a film. Oh and about the title, you'll just have to see the movie yourself to find out.